After Coach Steve recommended a plantar fasciitis night splint for the Green Girl, she looked into her options. After I poured over the available options, including Coach Steve's recommendation, the Pro-Tec Night Splint, I came to the brilliant conclusion that I could save money by simply attaching my injured foot to something that was at a 90° angle. I searched my apartment to no avail. I looked online to see what other injured cheapskates did. The most popular method involved an EVA sheet that was cut and softened in a pre-heated oven. That almost seemed like more trouble than it was worth so I quickly dismissed that idea and started going through every inch of my apartment. Needless to say, I couldn't find a single thing in my apartment that offered a 90° angle. Discouraged, I threw myself on the couch to mope. That's when I eyed my kickboxing gear in the corner of the room. 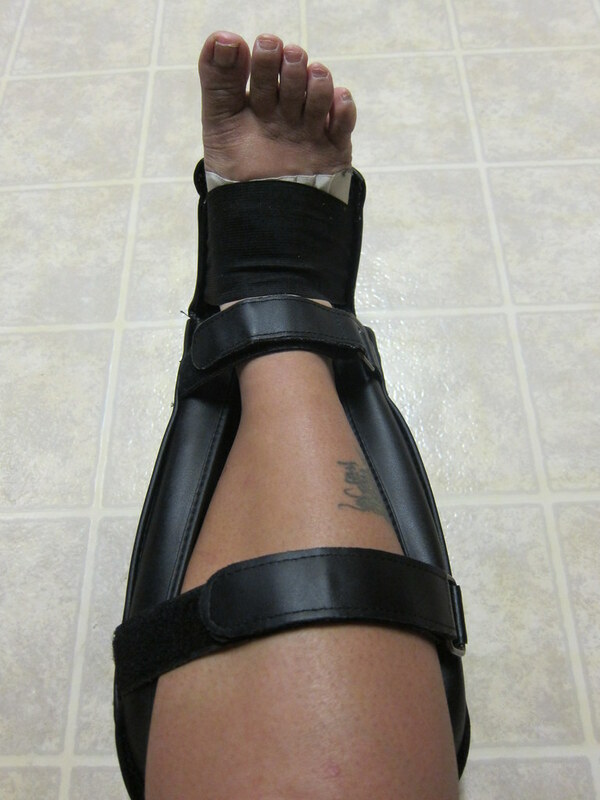 It suddenly dawned on me that my Century Shin Guards were pretty much the polar opposite of the Pro-Tec Night Splint. I could hardly contain my excitement when I realized they would do the trick. My foot isn't at a 90° angle but the reversed shin guard still forces increased flexion of my foot. I've slept with my mixed martial arts night splint for the past three nights and I've yet to make it through without waking up and violently yanking it off and tossing it across the room. Regardless, I am hopeful that the increased dorsiflexion will aid in my foot's recovery. One of the thriftiest and smartest gal's I freaking know :) GET BETTER LIL PLATER F. FOOT! You're cracking me up here, Greenie!! I can't believe you came up with that concoction and it's actually WORKING!!! Will you make a device to make my knee and heel happy, too? :). You are brillant, simply brillant. Thanks for the hugs...all is going to be ok for us, it is. We have to believe that or we'd have no hope. Now get that foot healed and get running pain-free!! Hugs back!!! 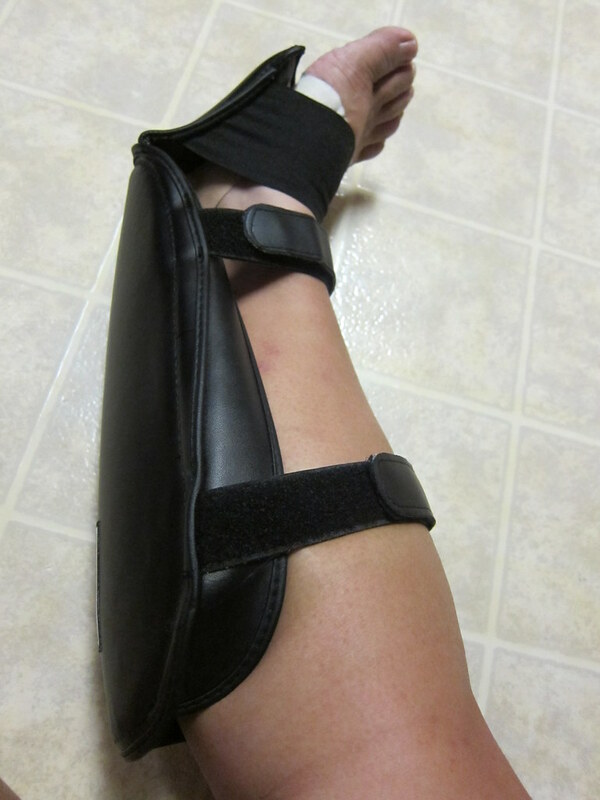 Cool how you MacGyvered that shin guard into a splint (verb). I can't think of MacGyver as an adjective. Sorry. That is so clever! I hope it does the trick for you and you can be injury free soon. Awesome inventiveness! I can imagine waking up and freaking out that there was something on my leg. One creative green girl, you are. Very creative. Hope it feels better soon! I really hope this helps you out. PF is no fun. Sad to say that I'm starting to have some trouble with my 'good' heel after all my battles with PF in my right foot. Hopefully I can keep it under control. Good luck with the splint! I can show you how to file a patent! This is a very nice post, so informative and interesting. Thanks for sharing such a great post.